Originally released on the Wii U in 2013, and followed closely by versions for Windows, Mac, and Linux in the months after that, it has taken almost exactly three years for Toki Tori 2+ to finally come to PlayStation. This gap will have somewhat deflected some of the hype surrounding it for Sony fans, but to merely glance over and miss this charming little 2D platformer would be a mistake. 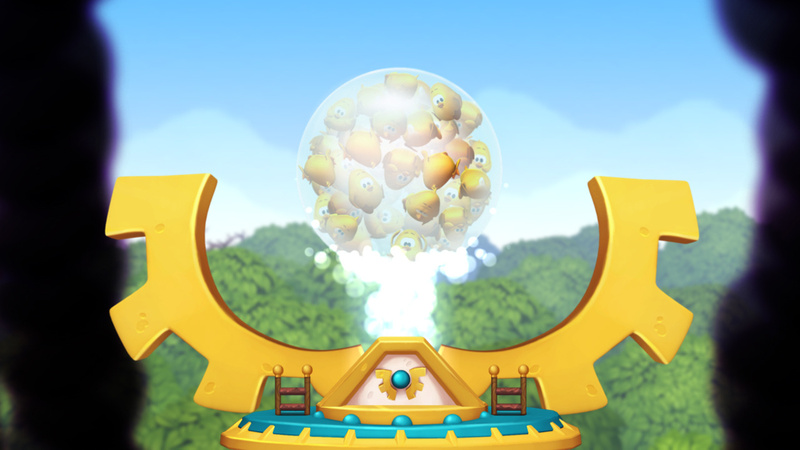 You play as a small yellow chick whose only actions are to walk from left to right, stomp, whistle, and climb. Really, there's not much more to it than that. 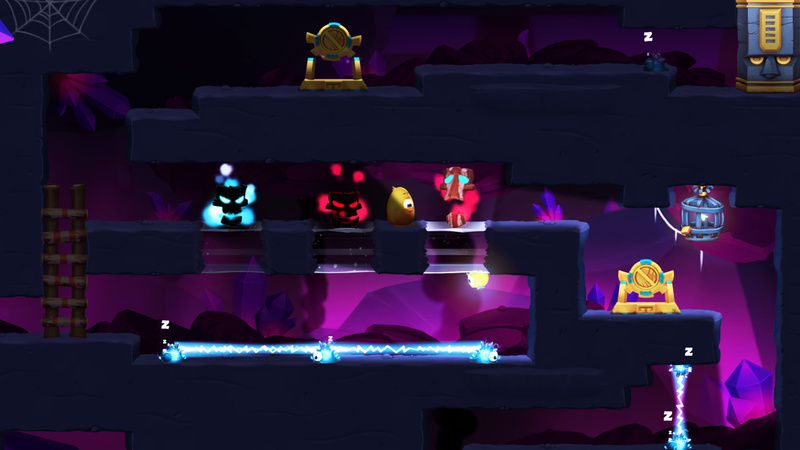 These simple controls must be combined with the environment in order to solve puzzles, activate gates, and move your way throughout the land. It's not instantly clear why you must do this, although the conspicuous absence of other birds, such as our protagonist, quickly becomes apparent. Not to mention the black goo which seems to be seeping out into parts of this otherwise beautiful land. The game offers very little by way of exposition. There are no cut-scenes or explanations, and there's no real manual to help you through the game either. Instead, the title does a fine job of making you feel like a small chick trying to figure out your environment. And figure it out you must, since the limited actions available to you means that exploiting the environment is the only way to progress through the game. In doing so, these simple controls prove to be incredibly versatile. Whistling draws creatures towards you and stomping scares them away – this is the basic groundwork. Stomping near a frog makes the frog burp, a useless action in itself, but if you do it once he's chomped on a berry, then he'll belch out a bubble, which surrounds and lifts your chick into the air and across otherwise insurmountable boundaries. It starts out simple like this, but figuring out how to manipulate the creatures within in conjunction with your limited oeuvre of moves become far more complicated later on. Indeed, you must time your stomps to make berries drop at just the right time in front of frogs that are hopping downstream. Or perhaps you need to attract fireflies by whistling to encourage them to fly alongside you as you make your way past the evil cave creatures which will gobble you up should you happen to let the light dissipate and instead be submerged in darkness. Careful not to let those fireflies get wet in the onrushing water, though, because the light will quickly wash out and leave you vulnerable to attack. You need to be aware of all of the little details in your environment as you move through it. You're not just a spectator, but an active participant in how things play out. Make a mistake and the odds are that you will perish and be returned to the last checkpoint. Thankfully, these are plentiful, and once you've figured out how to master a particular section, it becomes a far easier task to go through it a second time. On the off-chance that you fall into a ditch and can't get out, your chick can whistle a little tune that you must learn to return you to the beginning of that section. Other tunes are also possible, and these are achieved by altering the duration of your whistles – quickly tapping for a quick whistle, and holding down for a long one. Learning each of the five tunes opens up new aspects of the game as it progresses, and like the rest of the game, is introduced through the game's environment rather than a pop-up dialogue box. Birds in trees will whistle combinations, and by paying attention and emulating them, you will learn new combinations which unlock new features. Needless to say, the simplicity of the controls make figuring out the game's mechanics a relatively challenge-free task. But there are moments in this game which require a considerable amount of thought, and it doesn't always fall into place in the most obvious manner. It's not all about what you do, either, but when you do certain actions. Timing your moves to perfection and forging your path means thinking outside of the norm, even within the boundaries of a 2D platformer. It's this limitation on action which is simultaneously the game's strongest and most frustrating aspect. While most of the game plays out in its charming, colourful, chick-stomping, cheery way, there are sections which take so long to figure out that it's easy to give up or look for a guide. If you do this, though, it'll ruin the point of the release. The puzzles are its core, and the satisfaction that you receive from figuring out what eventually looks like the simplest of riddles through your limited abilities is what makes the game great. But leading up to this epiphany can often be frustration, which can sometimes jar with this cute and colourful world. 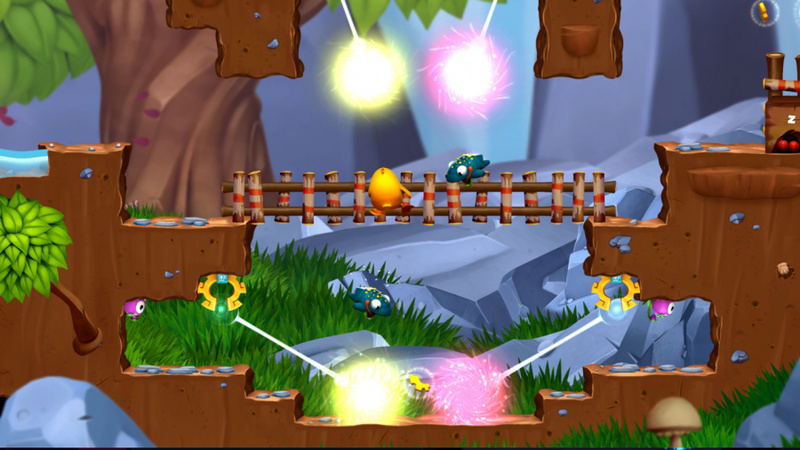 Toki Tori 2+ is a cheery tune of delight which thumps to the rhythm of a chick's stomp. It's a beautiful, colourful, and clever environment to play in, and harks back to those feel-good games which used to be so prevalent but have unfortunately fallen from grace in recent years. 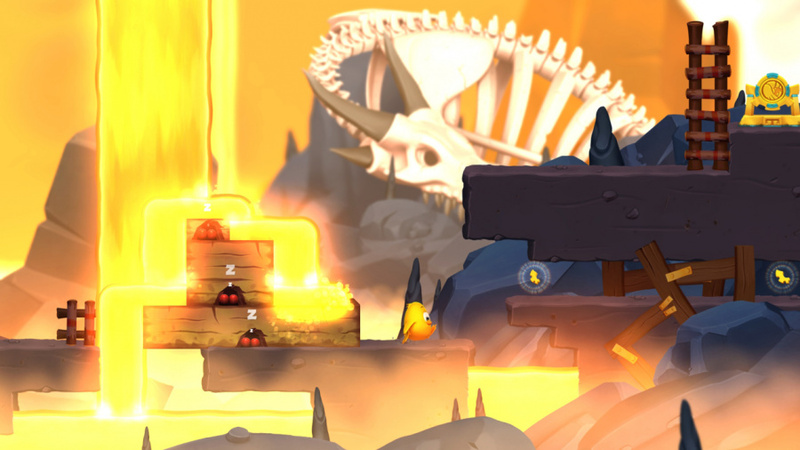 This is a fine 2D platformer with original ideas tied to a tried-and-tested formula of platforming goodness. It can be frustrating at times, requiring thought and precision, and a little vague in its exposition, but it rewards you for your efforts with bundles of charm and eventual satisfaction. @JaxonH Put it on the calendar, we agree again. Not often I get to write about a good Wii U game on PS4 - very bizarro world - but I bought and finished this one in a couple of weeks, probably about a dozen hours. Very cute, 2 or 3 really tricky puzzles my wife and kid helped me solve, but a fun time. 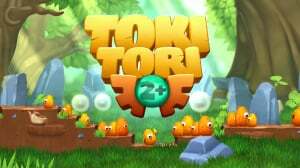 I had no idea Toki Tori was on PS4, I may pick this up, I really liked the game on Wiiware. Playing this at it's Wii U launch with my girlfriend at the time, taking it in turns and helping each other figure out puzzles was one of the best gaming experiences of my life. Highly recommend this to everyone. I'm not into cutesy aesthetics usually OR puzzle games but this was amazing.